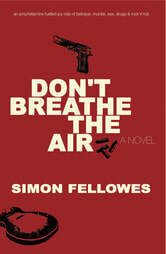 My debut novel is called 'Don't Breathe the Air'. 'Don't Breathe the Air' is also available for Kindle and other digital readers. ​My second novel 'Clean Skin' is available to purchase on Amazon and also the independent website Smashwords. My third novel 'Paradise' is available to purchase on Amazon and also the independent website Smashwords. Novel number four is called 'My name is Ferdinand'. It is available to purchase on Amazon. My fifth and most recent novel is called '10 Dead Mexicans'.